New Delhi April 16 (IANS) India is set to get a normal monsoon this year with average rainfall likely to be 97 per cent the India Meteorological Department (IMD) announced on Monday. The prediction stands at a moderate error estimated of plus-minus 5 per cent of the Long Period Average (LPA). A figure between 96 to 104 percent is considered normal monsson. 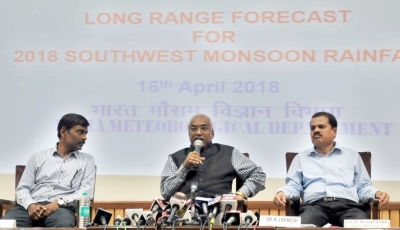 Earlier on April 4 private weather forecasting agency Skymet also predicted normal monsoon keeping it at 100 percent with an error estimate of plus-minus 5 per cent. However a clearer picture of the season which normally extends from June 1 to September 30 would only be available in June IMD said. "India will receive normal monsoon this year. The forecast suggests that the monsoon rainfall during the 2018 season averaged over the country as a whole is likely to be 97 per cent " IMD Director General K.J. Ramesh said at press conference here. Hoping that the monsoon will be constant and not sporadic IMD said that region based forecast will be available only during the second assessment in June and the date of the monsoon s onset into Kerala will be announced in mid May. In 2017 while IMD predicted 96 percent average rainfall in its first forecast in April the monsoon season over the country as a whole was 97 per cent of its Long Period Average (LPA). According to the weatherman below 90 per cent rainfall is considered deficient and at 95 per cent it is considered below normal. A figure between 96 and 104 per cent of rainfall indicates a normal monsoon and between 105 and 110 per cent above normal.